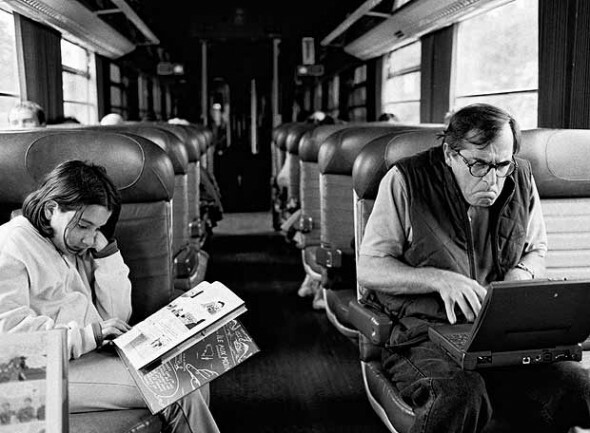 Paul Theroux on a train, doing what he does. What do Paul Theroux, Ryszard Kapuściński, Peter Matthiessen, and Jan Morris have in common? All four have advanced the art of travel writing, or writing that foregrounds a sense of place. And over the years, all four have been interviewed at 92Y’s Unterberg Poetry Center, where The Paris Review has copresented an occasional series of live conversations with writers—many of which have formed the foundations of interviews in the quarterly. Now, 92Y and The Paris Review are making recordings of these interviews available at 92Y’s Poetry Center Online and here at The Paris Review. I resist the idea that travel writing has got to be factual. I believe in its imaginative qualities and its potential as art and literature. I must say that my campaign, which I’ve been waging for ages now, has borne some fruit because intelligent bookshops nowadays do have a stack called something like travel literature. But what word does one use? … I think of myself more as a belletrist, an old-fashioned word. Essayist would do; people understand that more or less. But the thing is, my subject has been mostly concerned with place. If we write about human beings, in the most humanly way we are able to, I think everybody will understand us. I find humanity as one family. People really are very much the same in their reactions, in their feelings. I know the whole world. I can’t find much difference in the way men react to others’ unhappiness, disasters, tragedies, happiness. Writing for one man, you write for everybody. These recordings are the next best thing to a vacation. Their release is made possible by a generous gift in memory of Christopher Lightfoot Walker, who worked in the art department at The Paris Review and volunteered as an archivist at 92Y’s Poetry Center.